It all began several years ago when I joined Splitcoaststampers.....I was in awe!! So many creative people and ideas....I could sit for hours and browse. Notice I say browse because I was scared to death to leave a comment, I wasn't even sure I knew how. As I perused the gallery I kept seeing things like "further deets on my blog at:" - what was this blog world and did I dare venture in? Did I even know how to venture in. So began the research, one thing led to another and I created my first blog....my only post saying 'more to come'. Then things got busy and when I finally got around to logging in Blogger had made some changes and I had lost my header and things were a disaster - LOL - was this really meant to be for me?? But that creative and competative streak in me kicked in. I may be senior status at some places but that didn't mean I couldn't learn how to do this. Blogger really did make it easy and I got my header, and widgets all lined up and jumped in with my first post....I was even brave enough to begin posting on Splitcoaststampers!!! So here I sit a year after my first real posts - feeling pretty proud of myself for having gotten this far. I can't tell you how much I have enjoyed following and visiting so many of you - and the fun I have had in challenges. My husband laughed at me when I did the 'happy dance' the first time I won a blog hop. I did an even bigger dance later when I was recognized over at Our Daily Bread Designs and Stampin Sisters In Christ for some of my cards. It seems only fair I offer some Blogoversary Candy to those who check my blog out and make those lovely comments that bring a smile to my face. With the name Stamping Cowgirl it only seems appropriate that my candy have a western theme. If you want to post my blog candy on your blog for others that would be great, if you become a new follower as well (mention it in your post below) I will put your name in twice....in the meantime if you leave a comment below on this post, at the end of the month I will randomly pull a number and send you the goodies below. 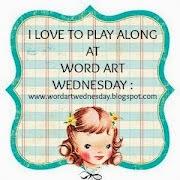 Thank you everyone in advance for the times you have inspired me and brought a smile to my face when I read your comments.....and thank you for challenging me to be more creative every time I visit one of your blogs. There are a total of 20 sheets of 12 x 12 paper all Cowgirl, western trim and my fav Horse stamp. If I find some more western themed things before the drawing I will add them to this. 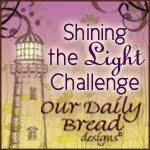 Very honored and blessed to be one of the cards chosen for recognition this week on Our Daily Bread Designs Blog for the recent challenge I entered. 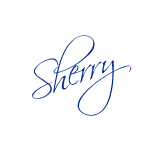 I love their stamps and they have a fantastic Design Team that truly inspires me on a regular basis. Having a blast playing and making step cards.....decided to make one for the challenge this week at Our Daily Bread Designs. Used a scripture from their Customer Favorites 2011 Scripture Series 2. One of my favorite scriptures. I have been so busy working on Christmas cards and western themes lately that I dug out some fresh bright colors to be a little different. The challenge was to use three different geometric shapes on the card...I used an oval for the Scripture, various rectangles on the card and circles behind my nice bright bling. Bwa ha ha ha Trick or Treat!! After not being in my stamp room for a few months I just buried myself playing.....for whatever reason I found myself focusing on Christmas and Horses, then it finally occurred to me that Halloween was just around the corner and I needed to get a few cards ready!! This is a card I made to send with a package to my son out west. I doubt my kids will ever be too grown to not send a little package of goodies at Easter, Halloween, Birthdays, etc. (Christmas we are all together - yeah!) Besides, He is one of my biggest fans and I think there is a good chance he has saved every card I have ever made him (One day I suspect he will meet a good woman and my cards won't mean quite as much). I know he will enjoy this one and the goodies I send with it. I have been playing with step cards and had this fab paper with eyeballs all over it, the idea of a graveyard for Halloween was just too good to let go of. I stamped the cute little Kolette Hall Hampton Art stamp 3x's in a row and used my Copics to color the grass and tombstones. The skull is a sticker from Recollections that I layered over some yellow/gold vellum for a spooky effect. Trick or treat is a dollar stamp and the spider webs along the outside are a Martha Stewart punch....had a lot of fun doing this and can't wait to do a matching treat bag and get it in the mail. Happy Haunting!!! I have been playing all week with my Impression Obsession stamp 'Santa Horses' by Melissa Gordon. This is one of about 5 cards I have used this stamp on - I just love each and every one of them. On this one I used my Copics to color and kept it rather simple - Some of these will probably go to the ranch with me as cards for friends I will see there. Working on some Christmas cards and playing with a little stamp I just love by Impression Obsession called 'Lamb Awaiting' - when I saw the challenge over at Our Daily Bread Designs I pulled out a sweet scripture stamp from their 'Porch' series and decided to make some small note cards. On the inside I have stamped 'May the miracle of Christmas live forever in your heart' with an old stamp I have from Stampin' Up. I spritzed the outside with some Sparkle Shimmer Mist......A sweet little card. Supplies used: Stamps from Our Daily Bread Designs, Impression Obsession, Stampin Up, CS, Corner punch, Copics, Glitter Gel Roll Pen. My daughter and I leave for the ranch in a few months and that has me thinking 'western' so I fooled around with a card I have been thinking of taking to the office manager when I go. The challenge at Our Daily Bread Designs was to make your own embellishment so I stamped my horse onto polyshrink and made a medallion for my card. I can't believe I am entering this without using one of their stamps (of which I own many) but this is the mood I was in today, I'll play with some of their lovely stamps later this week. Also saw that over at CES Challenges they were asking for cards with red and this certainly fits that bill. I used a Martha Stewart punch on the bottom of my cardstock and then ran it through a paisley EF. My stamp is by Inkadoo and stamped on plastic that I shrank down. I then used some punches and a die cut to place layers underneath my embellishment. The sentiment is from my computer and I used brads to attach it to the card. Challenges: Our Daily Bread Designs ODBDSLC79, Just Add Ink, and a die cu JAI-88, CES Challenges #57 See red, and Craft Your Passion challenge # 79 a card for all occasions. It is my older sisters Birthday this week and I have my stamp room unpacked enough to get to some of my stamps and things I need so I was able to make a card for her. In the big scheme of things it is a relatively simple card......I used a stamp I have been wanting to get inked up for a while and think she will enjoy it. While I could have been much fussier I was also short on time as I needed to get to the post office to get it in the mail. She has always been supportive of my hobby.....when she visited last year we spent one day down in the stamp room and she made several cute little gifts for her friends for Christmas. It would be great if we lived closer because I know we would be get together often to play and create. Materials used: Spellbinders, Net ribbon, glitter ribbon, Recollections Rhinestones, Pearls, Copics, CS American Art Stamp "Never Show It"
Challenges: Craft Your Passion Challenge 78, Anything Goes. Make it Monday Challenge 55.